Description: The Ruger New Vaquero is quite possibly the best value for dollar in a single action revolver on the market. They are tough, accurate, and reliable; everything you would want in a revolver. In addition to all those fine attributes this revolver is also an Illinois State Bicentennial special edition! It is chambered in the time tested .45 Colt caliber and features a golden hammer and trigger set against a mirror polished stainless steel frame and 5.5" barrel. Unlike a typical Vaquero, this edition comes with grip panels embossed with the seal of the state of Illinois. 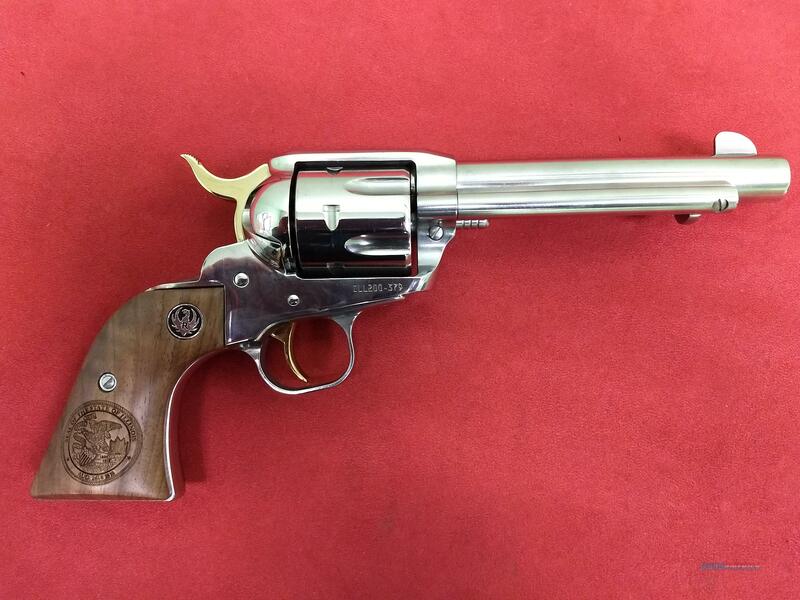 This revolver is a limited edition model and represents "1 of 500"! Warranty: All new firearms, new NFA items, and new accessories are warrantied by their manufacturer. All items have a 3 calendar day inspection period beginning on the day of delivery. Firearms and NFA items must be inspected at the dealer's location. If the firearm or NFA item is taken off the dealer's premises at any time, the inspection period ends. All items must remain unused during the inspection period.